This past week, my short story "Blameless" became my first ever published short story when Bartleby Snopes ran it at their web site. Bartleby Snopes runs eight stories a month, and at the end of each month you can vote for your favorite. I've gotten into the spirit of this, and as of right now I'm second in voting. Today is the second to last day to vote. If you haven't already, could you take a few seconds and go vote for "Blameless" at this link? It very easy, and it means I'll be in Bartleby Snopes's year-end pdf, where they compile all the stories that win. But the real winner is you if you decide to take a few minutes and read "Blameless" and the other October stories. Try Stuck Outside of Phoenix in print form for just $5. In 1992 I submitted a short story to five literary magazines. It was called "But God is a Deaf Old Fellow," and it was about the owner of a farm implement plant trying to bribe a minister into forgiving his sins. The story was never published. This past week (20 years later!) saw my first ever short story published by a literary magazine. The story is called "Blameless," and it's about what happens when your drummer's girlfriend takes a shining to you. You can read the story online right now at Bartleby Snopes. As we await news on Stuck Outside of Phoenix the Movie, I thought I'd take this opportunity to address the situation of my third novel, Badge. Last year I promised Badge would be released in 2013 at the latest. My thinking was, if nothing else, I'll self-publish it, which is what I did with both Ghost Notes and Stuck Outside of Phoenix. I've proudly self-pubbed for about a decade now, and I believe deeply in it as a means of communicating from writer to reader. If you don't believe that, look at the subheading of this blog. Still, I've decided I will not self-publish Badge. There are a number of reasons for this, which you'll no doubt be reading about in future essays, but let me outline the main one for you. As a DIY publisher, I've worn all three of these hats for both of my published novels, and by and large I've loved it. I've loved the challenge of trying to be a good publisher, which involves editing and proofreading and formatting the book. I've also loved booking readings and getting reviews and working social media, things ideally done by a publicity person. I've had some success, found some readers, won an award, sold some books. I don't regret any of it. It was an amazing way to learn the publishing industry. So, what does that mean for the publication of Badge? It means I have to find others to help me with these tasks. Finding these special folks could happen tomorrow, or it could happen years from now. Either way, it's my only real option at this point; I'd do Badge--a novel I've worked on for six years--a disservice if I didn't feel I could give it my all in every facet of the game. This novel (and every novel I write) means too much to me, so I'm not going to start shortchanging them now. Know that I'm constantly looking for others to help me publish and promote Badge, and that I will loudly update you--here and elsewhere--when I know more about its eventual publication. Until then, know I'm searching. First of all, the editor of Stuck Outside of Phoenix the Movie has fallen ill, which means the Nov. 5th premiere date will be impossible to make. No new date has been set. Please send all available good vibes, and I'll keep you updated here. Second, I have a new review up. It's of Dylan Hicks's rock lit debut Boarded Windows, and it appears at The Los Angeles Review. Check 'er out. Also, my second ever published political piece, which is called Politics and Sincerity, is up at The Nervous Breakdown. Check 'er out too. 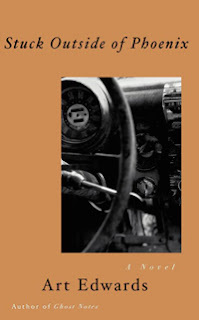 3) A review of Dylan Hicks's 2012 rock novel Boarded Windows. I was hoping to have some links for you, but nothing has solidified yet. I should have at least one by next week.